Beauty to Die For features the Lovers in Crime, Joshua Thornton and Cameron Gates in a race against the Angel of Death to clear the name of a dying woman’s son, who was framed for murdering Miss Pennsylvania. (Previously published in BEAUTY TO DIE FOR). Countdown to Murder returns to the Lovers in Crime where Cameron and Joshua try to solve the murder of a young pregnant widow before it happens. (Previously published in BEAUTY TO DIE FOR). Mystery fans will see that every dog has his day, especially if that dog is Gnarly. In Lucky Dog, Gnarly helps Mac Faraday to solve the murder of a wealthy society girl. (Previously published in BEAUTY TO DIE FOR). Dog Loving Mystery Fans will get a special treat when they read The Gnarly Rehabilitation Program. In this Gnarly Mystery Short, Bert and Ernie learn the hard way that crime does not pay when they dog nap Gnarly. (Previously published as a bonus feature with A WEDDING AND A KILLING). Gnarly, the rambunctious German shepherd, is also features in Lauren Carr’s Christmas short, A Gnarly Christmas. It is Christmas day and Gnarly has been up to his old tricks again. Now he’s in the dog house–or rather the boathouse–after stealing the Christmas feast! Moments after Archie and Mac leave Spencer Manor, Gnarly hears a call for help from Rocky, the Maltese down the street. Four assassins for hire have invaded the home of Rocky’s elderly owners. While the home invaders wait for instructions from a mysterious caller, Gnarly must plot to stop them. Can Gnarly save Christmas with only the help of an 8-pound Maltese dressed in an elf suit? (Previously published as a single short story by the same name). Spring Thaw is a collection of some of the best short writing mysteries that you will find around. I find that sometimes short stories can be missing information, move too fast or feel too disjointed at parts. This was not the case in this collection from Lauren Carr – we still had her great build up of the plot and character development that she is famous for but just not the length. The stories were easy to read one at a time and put down and come back to (but to be honest, I just couldn’t I had to keep reading – I love the characters so much!). The plots were well designed for a short story and well written – you felt engaged and a part of the story at all times. Gnarly takes centre stage near the end of the story! He is such a cheeky, clever and adventurous dog (you just want to give him a cuddle but only if you are on his good list!). He is that little bit of comic relief that you need in such intense mysteries. This is an excellent collection of short stories to cherish over and over – you will not be disappointed with this collection. Disclosure: I received a digital copy of this book. All opinions expressed are my own. 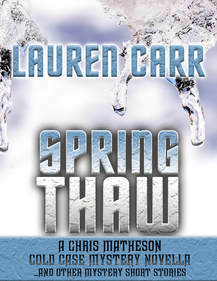 Thank you so very much for the great review of SPRING THAW! I’m really excited that you enjoyed this collection of short mysteries. Here’s wishing each of your followers luck in the giveaway!